Although created as a tourist attraction, the 1880 Town on Interstate 90 between Murdo and Belvidere, South Dakota is about as authentic looking as you can get for a western ghost town. 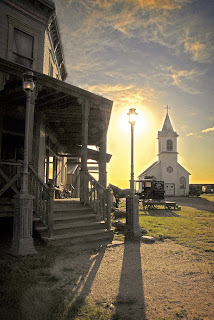 Area ranchers Clarence and Richard Hullinger have purchased old buildings from towns around South Dakota and assembled them here to create this movie-set style great spot for photography. "Main Street" is just filled with details that make fun nostalgic photos. 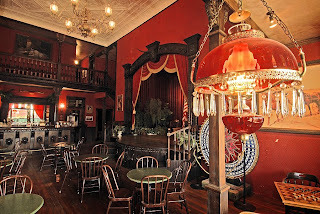 Inside the saloon, you would swear John Wayne or Clint Eastwood is going to show up any minute. Adding more ambience to the location are costume rentals. 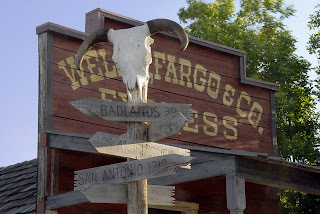 You can dress up as your favorite Old West hero and then wander the town taking pictures. It's a unique take on the "old-time" photos offered in many tourist destinations. 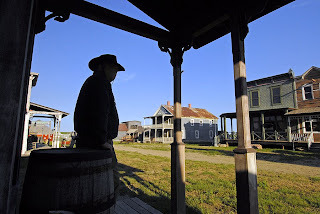 The 1880 Town has been used as a movie and television commercial filming spot several times. Furthering the connection is a large collection of artifacts from "Dances With Wolves." 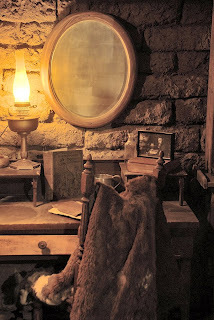 Here is the desk where Kevin Costner wrote parts of his diary in the movie. A handy fact for photographers is that the 1880 Town is open from sunup to sundown, making those "magic hour" shots easier to get. More information is available at www.1880town.com.